Everyone loves the baby dancing Groot and this Christmas Funko wants to take advantage of that fact. They are offering a new baby Groot who will sit in Holiday themed pot. A perfect stocking stuffer for Guardians fans everywhere. He is a vinyl bobble head and no I do not think he will actually dance to music. This is the first official Baby Dancing Groot toy! I will post more info on it as it becomes available but I am sure it will be more economical than the other options. The Funko site seems to have crashed on the news likely on a tidal wave of people trying to buy one so it is hard to get info right now. Funko also sells a normal Groot statue which is also pretty cute. News on Dancing Groot From Ryan Penagos at Marvel! For those asking about when you can get your Dancing Groot--pre-orders will start real soon! Official price/release info next week! I've made a number of calls about Dancing Groot toys today, you guys. Is Baby Groot in the comics? 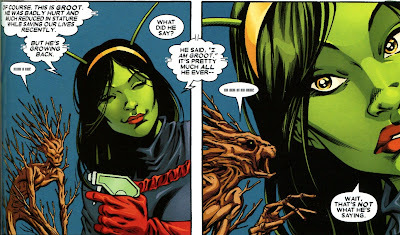 Some of you have also asked if baby Groot is in the comics. The answer is yes he is. He sacrifices himself a few times and each time the Guardians grow him back. Here is a picture here of the Guardian of the Galaxy Mantis watering Groot.